In collaboration with the Embassy of Switzerland in Lebanon, LAU brings professionals and students together to impart new experiences and ideas in the field. 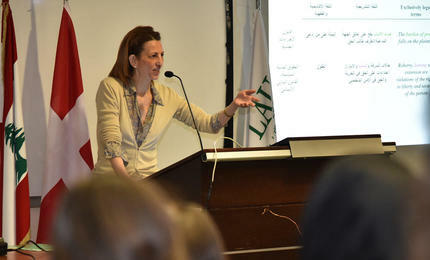 Participants got to exchange with a panel of professionals from different fields related to translation. Students from different universities and professionals gathered at LAU Beirut this week to attend a two-day symposium on pragmatic approaches to medical and legal translation. 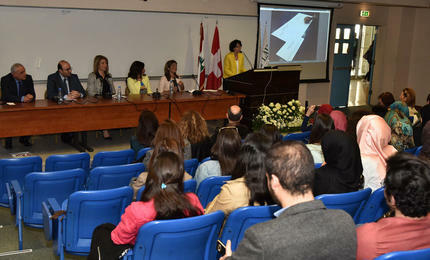 “The aim of this event is to keep students up to date with current research and developments in the field, and to put them in touch with other students and professionals,” said Associate Professor Nuwar Diab who organized the event in collaboration with the Embassy of Switzerland in Lebanon. Program coordinator of the B.A. in translation, Diab took the opportunity to announce a future student exchange program between LAU and the Faculty of Translation and Interpreting at the University of Geneva (UNIGE). To overcome the obstacles faced by health professionals and migrants in medical settings, UNIGE has created an innovative speech recognition translation mobile and online application called BabelDr, that is specialized for medical translation dialogues in situations of abdominal pain and cholecystitis (gallstone stuck in the cystic duct) diagnosis. BabelDr was developed at the request of Geneva’s largest hospital to help physicians deal with migrants, especially Arabic-speaking refugees from Eritrea, Afghanistan and Syria, who form the majority of asylum seekers in the country, explained Sonia Asmahène Halimi, assistant professor and co-director of the Translation Department and head of the Arabic Unit at UNIGE. The issue, Halimi pointed out, lies in the differences between the countries’ legal systems even if they share a common language, as is the case with the Arab-speaking region. She explained that terms used to translate ‘courts’, for example, vary according to each legal system, adding that the best approach would be to fully understand the function of the term in the source language, then try to find its correspondent in the target language. Her presentation was followed by a panel composed of a sworn translator, a notary public, an attorney-at-law, an interpreter, and an expert in the verification of handwriting and fingerprints. From the procedures involved in becoming a sworn translator to ways of identifying falsified or forged legal and confidential documents, the experts shared their experiences emphasizing the importance of accuracy, confidentiality and authenticity in dealing with clients.